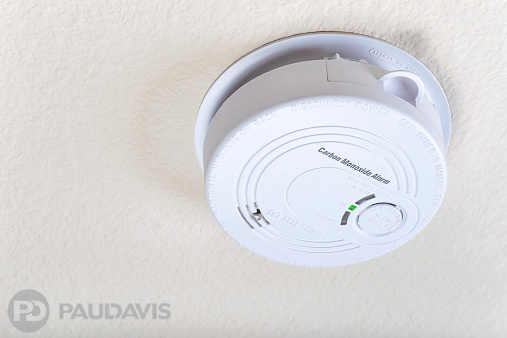 Carbon monoxide is a deadly and silent killer that can strike you in your own home. Furthermore, the rate of these deaths increases during the cold winter months. With people dying each year due to this, it is paramount that you take steps to prevent this from happening to you. Carbon monoxide (CO) poisoning traditionally occurs when you use a gas stove, kerosene heater, or other fuel burners for food or warmth. Carbon monoxide is created as a byproduct of combustion. When using these fuel-burning items, elevated levels of CO can occur when the fuel does not burn out fully. The need for additional means of gaining warmth is one of the reasons that medical professionals see CO poisoning and deaths increase during the winter. It is never too early to start taking steps to prevent CO poisoning from happening in your home. Install CO detectors and have them checked regularly. Installing CO detectors, especially in sleeping quarters, is the only way to detect increased CO in the air. Otherwise, CO is undetectable to humans and animals. Without a detector, there is no way for you to know that you are at risk. Know what symptoms to look for. If someone is experiencing CO poisoning, immediate action needs to be taken. Exposure can make someone feel like they have the flu, but a fever will not be present. You can also expect some memory loss and loss of balance. If you see these symptoms and suspect CO exposure, call for emergency services immediately. Turn off all appliances and open the doors and windows to let fresh air into your home. Have proper ventilation within your home. When you cook, do you use a vent hood? How do you ensure that fresh air is circulating within your home? Without fresh air circulating in your home, CO levels have nowhere to escape and you are more at risk of CO exposure. Don’t use gas ranges or ovens to heat your home. If your home is cold, using a gas range or oven is not the answer to your heat problem. Make sure you are prepared for cold weather without having to resort to this for heat. Have your chimneys and flues cleaned regularly. Soot accumulation threatens to expose you to CO and other chemicals you don’t want. Don’t run a generator indoors, even if the doors and windows are open. Generators should only be used outside. It isn’t a coincidence that besides winter, the other time when we see an uptick in CO poisoning is when there are power outages. Since CO is odourless and undetectable without a CO alarm, the best way to protect yourself is through prevention. Follow our steps and make sure you don’t become one of the thousands who experience CO poisoning.